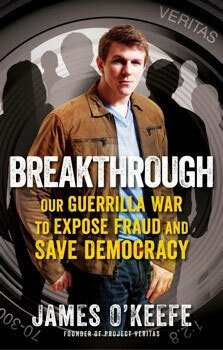 James O’Keefe: Breakthrough – Review and Giveaway! Kemberlee Kaye was nice enough to provide a copy of James O’Keefe’s book, ‘Breakthrough: Our Guerilla War To Expose Fraud and Save Democracy’ to our own Neal Dewing to write a review. It is a signed copy so that makes it even better. Neal has written a review of the book and…. We are going to give it away to one of you. Neal promises he didn’t spill any Colt 45 on it, nor has he drooled on the it. However, in order to read the review and have a chance to win the book ,you will have to sign up for the Pocket Full Of Liberty Newsletter. Now….we promise not to spam your email account. Our newsletter does not go out daily. We have no set schedule because part of what we do is offer content that is exclusive to the newsletter. So when you get it, you’ll be reading content you won’t read here on PFoL. For anybody that has already signed up, you’re entered in the giveaway as well! So what are you waiting for? Sign up and get a chance to get the book!